Well, it took us a couple minutes to learn to love it. When the always adventurous Maia told us that today we would be working alongside another department, most of us were a little reluctant. It’s not that we don’t thoroughly appreciate the talents of the Instrumental Music department or the merits of working together, but I (and I’m sure many other CWers can attest to this) experienced a sudden onset of social anxiety. It meant we would have to SPLIT UP and it’s so HOT OUT WHY would they make us MOVE out of the CW room and what if they DIDN’T LIKE US and what if they JUDGED our poetry?? 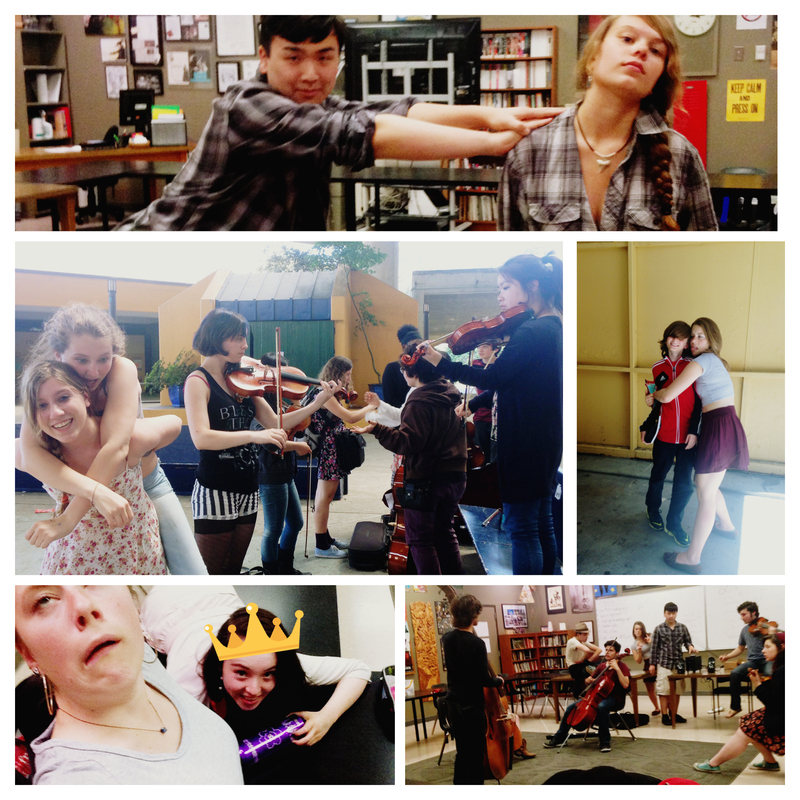 But, with the urging of the always wise seniors and Maia, all fourteen of us trudged on over to Orchestra room. We were then split up into groups (one or two CWers alongside three to five musicians), and assigned decades from which to compose a musical piece and a written piece to accompany it. My group, assigned the 1920s, wrote a short piece that begins: “Speakeasy, hold my secrets….” So you know there’s going to be some pretty good flapper drama going on in ours. Anyway, as I looked around to all the other CWers and musicians, working side by side to create their own beautiful, original pieces of art, I realized something: collaboration is scary, but its rewards enormously outweigh those few seconds of social anxiety. Interdisciplinary collaboration is so valuable and important in instituting a real feeling of community in the school and an appreciation for other art forms outside of your department, and I really hope that this day sets us on a path for collaboration between all departments in the future.